* From the Editor- “Rum and Literature” by Luis Ayala. 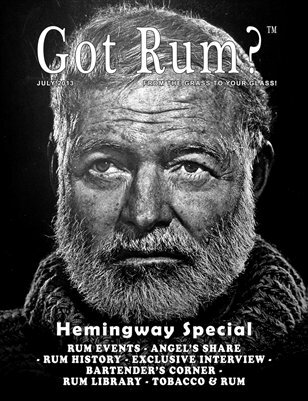 * Hemingway Special- The Man, The Legend. * The Angel’s Share- Featuring Papa's Pilar Blonde Rum and Papa's Pilar Dark, reviews done by Paul Senft. * Bartender's Corner- Dr. Ron A. Ñejo talks about "From Rum Sour to Frappe to Daiquiri" and also about "Essential Rum Cocktail#2: Daiquiri". * Rum Event- Coverage of the II International Rum Conference that took place June 4th - 8th in Madrid, Spain. * Exclusive Interview- Interview with Mrs. Kelly Railean, Founder of the American Rum Association (ARA). * Rum in History- A timeline of what happened in the month of July throughout history from 1521– 1855. * Rum Library - Review of “Bar Florida Cocktails, a 1935 Reprint”. * Pairing Tobacco & Rum– Mr. Philip Ili Barake brings us “A Good Story...”, featuring: The “Short Story” cigar, from the Arturo Fuente Hemingway line and a Daiquiri created by Mr. Luis Felipe Cruz, Bar Manager at the Hotel Noi in Santiago, Chile.